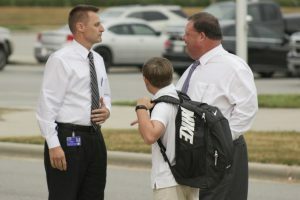 JCS Superintendent Dr. Ross Renfrow (right) drops off his son John Ross Renfrow (center) for his first day of school on Aug. 29. Welcoming them to the school is Archer Lodge Middle Principal Ben Williams (left). 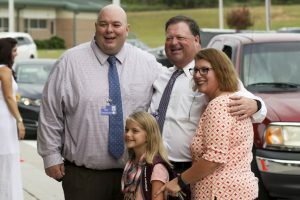 Johnston County Schools Superintendent Dr. Ross Renfrow celebrated the start of the school year by visiting every school in the district on their first day. In a county roughly 800 square miles with more than 40 schools opening their doors to students Monday, the trip to visit all of them in a day came with challenges. In fact, to help prepare for the expedition JCS Transportation Services mapped out Dr. Renfrow’s 175 mile journey to make the route as efficient as possible. Powhatan Elementary Principal Dan Kerwin (left) welcomes JCS Superintendent Dr. Ross Renfrow (center), Assistant Superintendent of Innovation Dr. Fran Riddick (right), and Loryn Riddick (front) to his school. “The folks in transportation do such a tremendous job in routing our buses and being so efficient each and every day, so I asked them to give me a one-day route to start at home, visit every school, and end up back at the office,” said Dr. Renfrow. Dr. Renfrow started his journey at 6:30 a.m., then strategically made his way throughout the county, even dropping his own son off for the first day of middle school. As the first day of of school is an emotional day for many, Dr. Renfrow said he shared the same excitement as students, parents, and teachers in part because this is his first full year serving as superintendent. During his visits Dr. Renfrow met with community members, students, parents, teachers, and administrators. “I believe this sets the expectation for our students and staff. It lets them know that he has a vested interest in what’s going on throughout the district,” said Cleveland High Principal Kendrick Byrd. 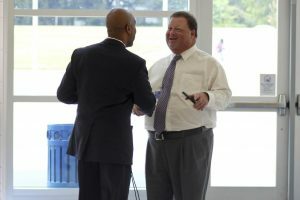 Cleveland High Principal Kendrick Byrd (left) welcomes JCS Superintendent Dr. Ross Renfrow (right) to his school Monday, Aug. 29. Byrd, like all principals in the district, had the opportunity to meet one-on-one with Dr. Renfrow and share with him the day’s progress. As a former teacher and principal, Dr. Renfrow said he knows the importance of making the first day of school visit. “I can go out on the first day and within two or three minutes do a snapshot of what the first day is like,” he said. With school back in session, Dr. Renfrow urged community members to be cautious of students traveling to and from school. “The prayer every morning and every afternoon is that every student gets to school safely and returns home safely,” said Dr. Renfrow.